Like most Americans, you probably spend a good deal of time in your car. Between your commute to and from work, carpools to soccer practice, and your weekly trek to Grandma's house, your car is the ongoing location for a good portion of your time. And like any place where you spend a lot of time, your car has a hard time staying clean. Keeping your car tidy day in and day out can seem like a momentous task, especially if there are several years' worth of crumbs already piled up in that small space, but having a clean car can be simple with these 5 quick tips. Don’t Eat Inside: Yes, the occasional drive-thru meal may not seem like such a bad idea, but a majority of the buildup of trash and crumbs in your car come from food. Skip out on the meals while driving, and if you absolutely have to, pack low maintenance snacks, like carrot sticks, from home. Wipe and Polish: Your car is an expensive investment, so treat it well with a little polish. Using warm water and a few drops of lemon juice, take a rag to all hard surfaces inside of your car to wipe away dust and grime. This will only take a handful of minutes, and when done every few weeks, will leave your car feeling brand new again. Knock Your Shoes: Before climbing into your vehicle, knock your shows on the side of your car to kick off any dirt, snow, or grime that may have accumulated while walking around. This task takes just a couple seconds, but will save you from transferring a new mess inside. Shine Those Windows: Your car’s windows are important to both your safety and sanity, so wipe away those finger smudges with one cup water mixed with one-half cup vinegar, and a few drops of rubbing alcohol. This eco-friendly solution will have your windows crystal clear in no time. Vacuum Regularly: When was the last time you vacuumed your car? Probably not recently. 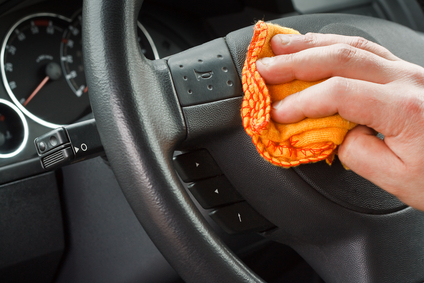 The best way to keep your car clean is to vacuum it thoroughly at least once a month. Make a plan to vacuum out all the nooks and crannies on the last Saturday of the month. Keeping your car clean means more than just running it through the $5 wash when it looks bad. Take a half hour once a month, or even just a minute or two a day to show your car some TLC, and it will increase in both beauty and value.